Location: Elmwood Cemetery on the northern edge of Elmwood. The G.A.R. 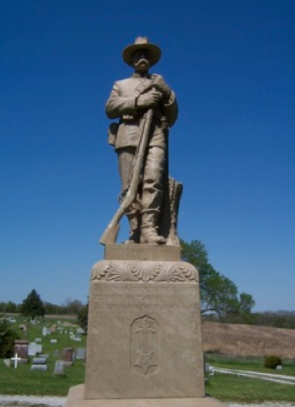 monument at the Elmwood cemetery was dedicated on November 7, 1903 at a cost of $400. It is 13 feet high and came from Bedford, Indiana, and was the only one of its kind in Cass County. On Memorial Day, 2008, the monument was rededicated after being refurbished by a sponge-jet cleaning and sealing process.